Garry is also the brainchild of Recovery in Action, a project that aims to “reduce the social isolation experienced by people with mental health issues, living within our inner city communities”. Below he talks about his experiences at the sanctuary. ‘On one shift I did there our team worked with a young lady who presented at Kings A &E She was, in her own words, feeling suicidal and had to a degree lost all hope. 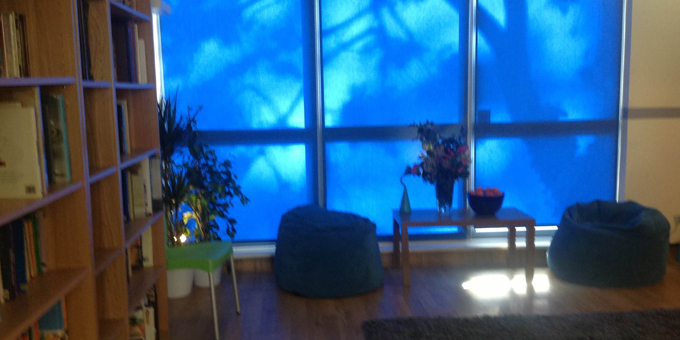 Initially the two front line staff brought her into the hub space to get an idea of exactly how we might help her before she was invited into a quieter ‘soft room’ area where we have an array of bean bags, cushions and soft furnishing that usually helps people to get more comfortable and relaxed. As peer supporters we use this space to engage people in conversation, share our stories (where relevant), offer information and generally invite clients to use the time and space in whatever way they’d like. This particular young lady chose to tell us about her current struggles and over tea and biscuits we spoke about a whole array of shared experiences. This was a very useful experience for me as I began to see the potential of this idea after seeing the young lady ‘open up’ in conversation and start to feel more relaxed. She said she felt much more resolve and was glad not to have been sent home from A & E; as usually happens when people present there. A & E can become so busy and staff so stretched that unfortunately anything deemed not a dire emergency can be treated with less attentiveness and people with mental health issues who struggle are often sent home and told to go to their GP. Garry’s Recovery in Action is a structured programme of group work and tailored one-to-one support that enables participants to identify and achieve personal goals, work towards better social integration and develop pathways to a healthier, more positive and sustainable life experience. The pilot is hoping to produce a report soon.